A pleasant evening, perfect clothes, a place with a view, sensuous music, great food and the sight of your sweetheart walking slowly towards you – enough to melt the most stern of hearts and rattle the butterflies piled up in your stomach! Such is the quality of love. Just the very thought of your crush or loved one can take you across dimensions, transcending time and space and make you feel euphoric. The dreams that you have for him or her is what keeps life going, leaving something to look forward to every day. To live your dreams and hold your lover’s hands for eternity, you need to let him or her know how much they mean to you and how beautiful life is in their presence. For that, you need to have the perfect conditions – ambience, occasion and moment. With Valentine’s Day approaching soon, the occasion has been taken care of. What about ambience and moment then? Well, to help you out on that, we have compiled a very heartfelt list of some of the most romantic Mumbai restaurants you should visit with your lover this Valentine’s Day. No matter if you are proposing, letting him or her know about your feelings or just celebrating love and bonding, these are the places that will make your time all the more special and beautiful. Before you reserve tables, we thought we would also share some insights on setting the right mood and feel for the perfect moment. We know you’ve been planning all that out for the last six months but some tips could help. Apart from the music the restaurants play, you can carry a tiny portable Bluetooth speaker and place it on your table. With a custom playlist of the songs your lover cherishes, you can make the evening more special by playing it on less volume enough for it to be audible to just the two of you. With practice, you can also note down the most sensuous lyrics of the song and time your short performance by singing the lyrics to him or her looking at the eye. Some things are just inevitable in creating a romantic mood. Poetry is one such aspect of romance. If you can, pen down a couple of verses on how you feel about him or her. It needn’t be out of the world but simple and effective enough to convey the message. You also don’t have to rhyme sentences. Just tell what your heart says and the rest will be taken care of. Being awkwardly comical works too! So yeah, “Baby, you’re all that I want when you’re lying here in my arms, I’m finding it hard to believe we’re in heaven.” Read on as we complete the song by Bryan Adams! Anything to do with French is romantic and so is this magnificent restaurant that speaks of the French in its décor and ambience. 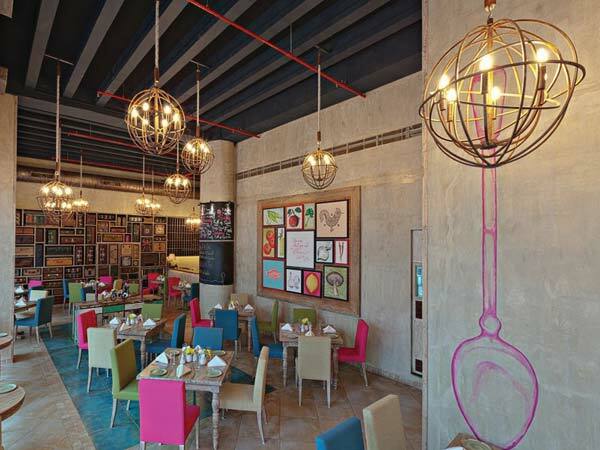 Nestled amidst the glitz and glamour of the Nariman Point is this cosy place called the Sassy Spoon. The gushy curtains, the fairy lights, the furnishing and the chandeliers all come together to create an ambience for the proposal. All you have to do is prepare a speech that suits the place. 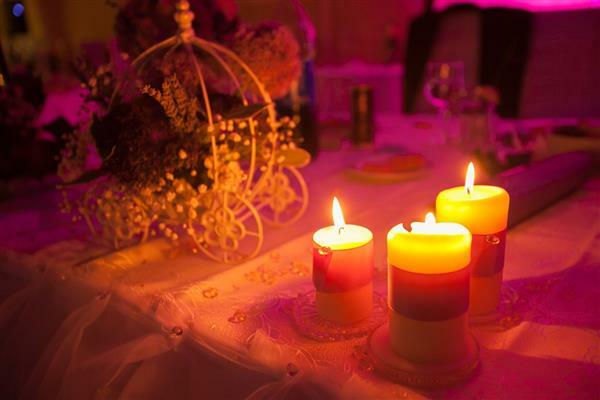 Complementing the décor is the food and the dessert that make your evening all the more special. Here, this Valentine’s Day could just be yours! 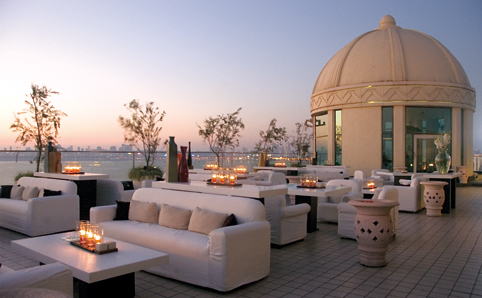 Placed beautifully on the rooftop of the Intercontinental Hotel, Churchgate, this place looks like it is built for date nights. The ambience is all white perhaps because they know it would turn pink in blush this Valentine’s Day. With an amazing view of the Queen’s Necklace, overlooking the Arabian Sea, this is the place your lover could look away from your eyes and say yes grinning at the limitless expanse of the ocean. Don’t forget to order house wines and their pizzas when here to make your evening perfect at one of the best romantic Mumbai restaurants. Yet again, a classy place to share your feelings about him or her! If your lover has anytime said he or she wants to be on top of the world and feel top of the world, this could be the place that could fulfil both the wishes. With the place beautifully looking the Mumbai skyline, all lit up, just like your future, this is the place that you will cherish visiting for a lifetime. Be it their music, food or ambience, everything is so perfect and like how you want it to be. Here, the evening will have just the two of you, the symphony of the silence between you two, the skyline and sumptuous food! Isn’t it always great when restaurants understand our requirements for private space and conversations? If you share our thoughts, you would love Sky. Apart from the breathtaking ambience, service and food menu, Sky is one of the very few romantic Mumbai restaurants that have seating tables conveniently separated by trees to avoid intrusions and buzzing of people. 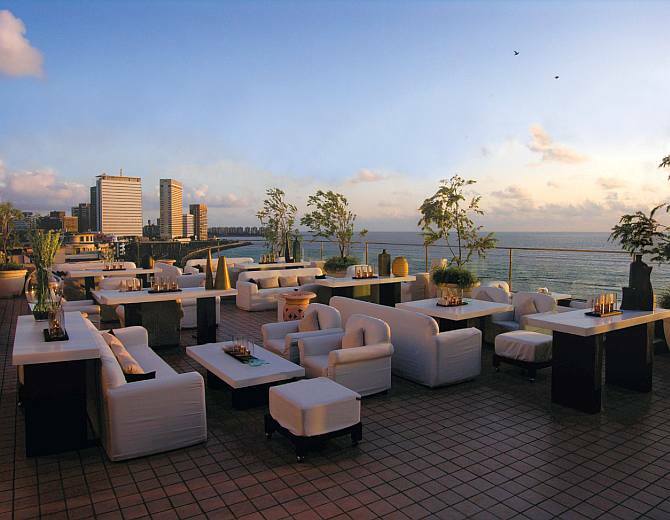 This makes it one of the most romantic restaurants in Mumbai. As the sun goes down, the mood lights gradually come up from under the trees, making the ambience all the more beautiful. With just the sky in your way and nothing else, this aptly named restaurant truly deserves to be part of your special day. There are four things that make our life as a human complete – beach-view, beer, pizza, and the company of our beloved. When all these are together, life metaphorically attains salvation and its purpose. That’s what the amazing guys at Pizza By the Bay do. 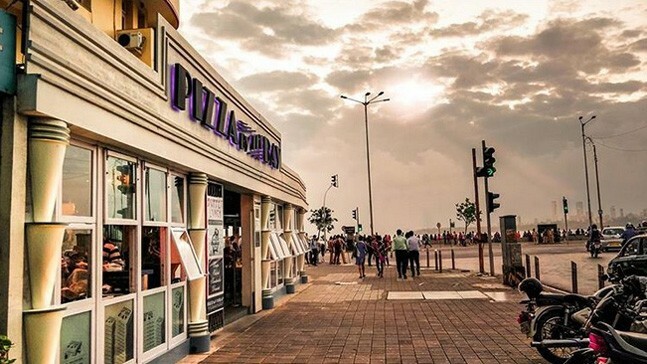 With amazing choices of pizzas, a great view of the Marine Drive, good music and perfect ambience, this is one of the best romantic Mumbai restaurants to go on a romantic date. And if the love for pizza is mutual, it has to be all the more happening! Simply magical this place is. If a private space away from the chaos of the city is what both of you look forward to this Valentine’s Day, this is what we have on our list – Farmhouse Sea n Sand. 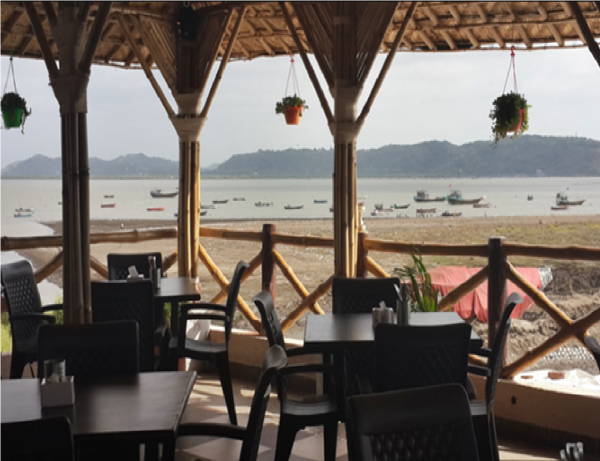 Located in Vasai, this is a perfect private retreat where you have an exotic coastline, little hindrances from people, noise, leaving just the two of you together with some great food. 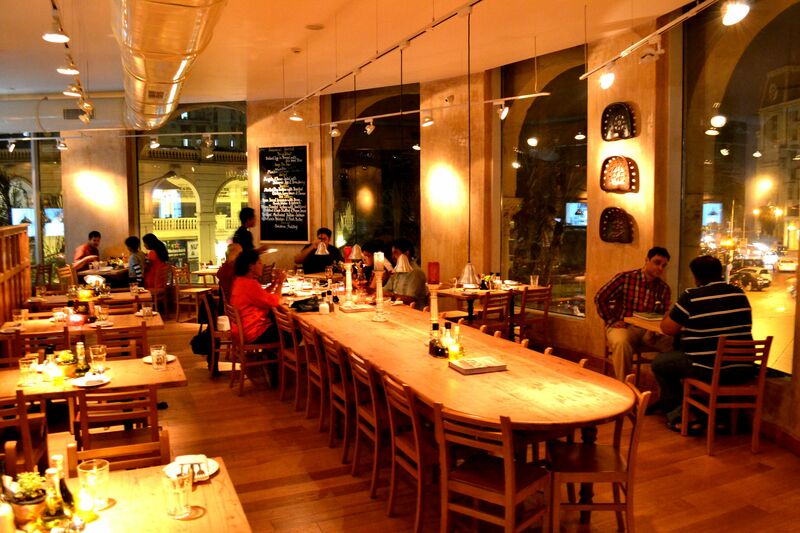 This is one of the best romantic Mumbai restaurants for a romantic evening and to open up about your love. When here, try out their seafood platter and sing to him or her with the Karaoke features this place offers. If you are a little old school, a movie buff or a classic literature reader, we are sure you have a special place in your heart for antique and heritage places. Well, here is one romantic Mumbai restaurants that could take you back in time and give you an ambience you have imagined so far on a perfect evening with your loved one. With classy furnishing, décor and dim lit interiors, this is the place to hold a glass of Chardonnay on one hand and the hand of your lover on the other. This place stands synonymous with romantic and if you further want to make it special, reserve a table for brunch and find out why this could be more special. While we have you covered your perfect and long-awaited evening, it is now up to you to share your thoughts and feelings in the most poetic of ways and sweep your crush of his or her feet. With the occasion, moment, and ambience all in place, simply own the day! Good luck! “And when you smile, the whole world stops and stares for a while, cause you’re amazing, just the way you are.” Classic right? Romance is timeless. The feelings and emotions you feel with your significant other cannot be replicated with just anyone else, And now, if you are looking to pop the question, we have got you covered with some of the best Romantic Mumbai Restaurants for your big day!